In case you missed it Lucasfilm has confirmed the new theatrical release dates for the upcoming 3D versions of the next two films in the Star Wars prequel trilogy. Star Wars: Episode II Attack of the Clones will release, for a limited time only, in U.S. theaters on September 20, 2013, followed shortly by Star Wars: Episode III Revenge of the Sith on October 4, 2013.
International release dates will be announced soon. No word on the re-release of Episodes VI, V and VI in 3D. 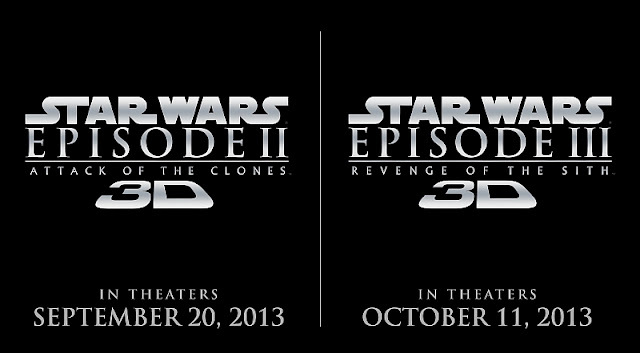 I believe it is Lucasfilm's intent to release them in 2014 to bridge the gap for Episode VII in 2015. We may learn more about this during Disney's D23 Expo or Star Wars Celebration Europe II in 2013. Just a thought.